Now that Amazon boss Jeff Bezos has exposed National Enquirer boss David Pecker for trying to blackmail him, it’s fairly easy to figure out that A) Donald Trump was behind it all, and B) Trump likely used his shared indebtedness to Saudi Arabia to convince Pecker to go through with it. But now an earlier-reported aspect of the saga seems to have a whole new context, and it involves Roger Stone. Last week, before we knew the full extent of the Pecker-Bezos story, the Daily Beast reported that Jeff Bezos’ mistress’ brother was trying to get to the bottom of how the National Enquirer was able to expose the affair to begin with. To that end, the brother decided to reach out to – of all people – Roger Stone and Carter Page. Wait a minute here. If Donald Trump’s friend David Pecker’s tabloid newspaper had just exposed your affair, and you were trying to figure out who was really behind it, would you consult with two of Trump’s most notorious former political advisers on how to run that investigation? 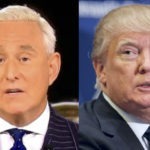 Everyone knows that Stone and Trump talk. If you communicate with Stone about something like this, then by default, you’re running it past Trump, whether you realize it or not. This is all very strange, to say the least, particularly considering that this happened around the same timeframe in which Stone was indicted and arrested on seven felonies. There is no evidence that Donald Trump and Carter Page talk. We have no idea if Page is under investigation by Robert Mueller. We don’t even know what planet Page is from. But the Roger Stone thing jumps out with big red flashing lights on it. You’ve got to be kidding.